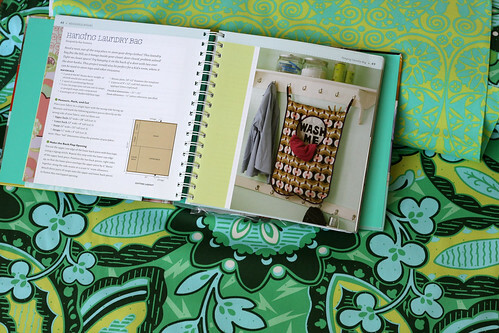 Jacqui selected Amy Butler’s Soul Blossoms Home Decor fabric Trailing Orchid Grass. 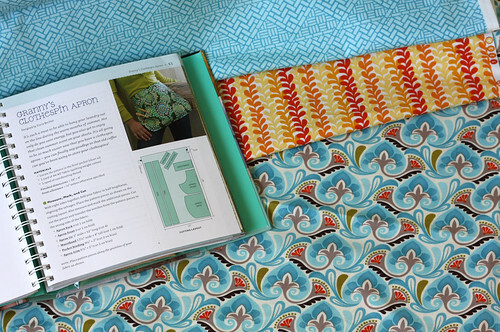 She’s creating her own binding using Amy Butler Soul Blossoms Temple Doors Fresh Mint. Diana selected three fabrics from the new Kate Spain Central Park Collection: Trefoil Aqua, Hernshead Yellow and Cobblestone Aqua. Diana loves to collect sea glass and was inspired by the amazing colors in Central Park. Place the apron front on top of the apron back with both wrong sides facing up, matching the notches at the top edge, and pin in place. Press one long edge of the apron trim 1/2″ to the wrong side. Position the right side of the apron trim on the wrong side of the stacked apron front and back pieces. Raw edges of the apron trim will align with side edge of the stacked apron front and back pieces. Note that the apron trim will overlap the apron front by 1″. Stitch through all layers around the curved edge of the apron, leaving the top notched edge open. Trim entire seam allowance to 1/4″. Clip to but not through through the seam along the rounded corners to ease fullness. Turn the apron right side out and press curved edges. Fold the apron trim to the front. Press and pin trim in place, ensuring that it covers the trimmed seam allowance. Topstitch around the finished curved edge of apron at 1/2″, making sure to catch the edges of the apron trim. Match notches at top edge of apron and baste in place using a scant 1/4″ seam from pocket edge to pocket edge.